Chemtrol. Chemtrol carries one of the largest selections of control systems for automated water treatment in your pool or spa, as well as those for automated industrial applications. All of these products feature the most reliable and state-of-the-art electronic technology. CAT 1000. The CAT 1000 is the only pH-control system that constantly monitors the pH level in your pool and makes automated adjustments to the chemical levels based on the latest readings. S.R. Smith. S.R. Smith offers one of the largest selections of additional pool products like ladders, diving boards, lifts, steps, drains, and slides. Quaker. 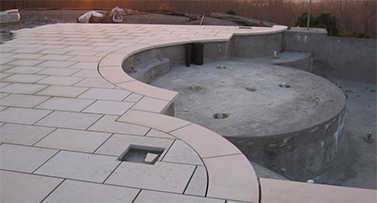 Quaker offers a wide variety of pool products, including steps, drains, and customized products, all designed to make your pool as safe and hospitable as possible. Levolor. The Levolor electronic monitoring system can detect low water levels in your pool and alert you when more water needs to be added to the pool. Aquastar. Aquastar is a leading producer in pool safety, dependability, compliance, and innovative technology around the globe. Rainbow. Rainbow carries more than 60,000 unique pool and spa products – all from reputable manufacturers – so you get exactly what you are looking for. PoolNaturally. Make your pool maintenance a little easier this year with the PoolNaturally system. PoolNaturally can lower the chlorine and other chemicals required to keep your pool clean by up to 90 percent. Inter-Fab. If you want to add a more elegant touch to your pool such as a rock waterfall, a boulder, rails, or specialty-diving boards, check out the lineup of products from one of the world’s leading manufacturers. IntellChlor. IntellChlor is an innovative producer of pool chemicals that uses everyday table salt to produce all of the chlorine needed by your pool in a safe, automated and effective system. Blue-White Industries. For all of your water treatment accessories, check out Blue-White Industries and its selection of metering pumps and flow-meters, from variable-area to ultrasonic. Goldline Controls. Goldline carries a range of automated management equipment necessary for maintaining the safety and durability of your pool or spa. Jandy. 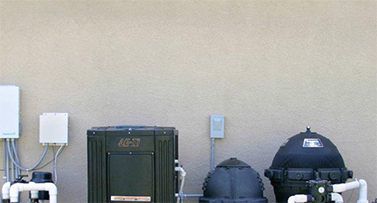 Jandy’s award-winning automation solutions go hand-in-hand with their professional-grade pool equipment, including pumps, filters, valves, lights, and chlorinators.